A membership product is the same as as subscription product without the recurring billing. Both membership products and subscriptions create customer accounts and can be used to define membership access rights to content on your WordPress website. A membership product is given a duration during which the membership is active such as 30 days or 365 days. When the time period expires the customer will not be automatically charged again like they would be with a subscription. You can use the notification system built in to Cart66 to send email reminders to your customers that the membership product is about to expire and even offer coupons or as an incentive to encourage your customer to renew, but the decision to renew the membership is up to the customer. If you want your customer to automatically be billed again on a recurring basis, create a subscription product. 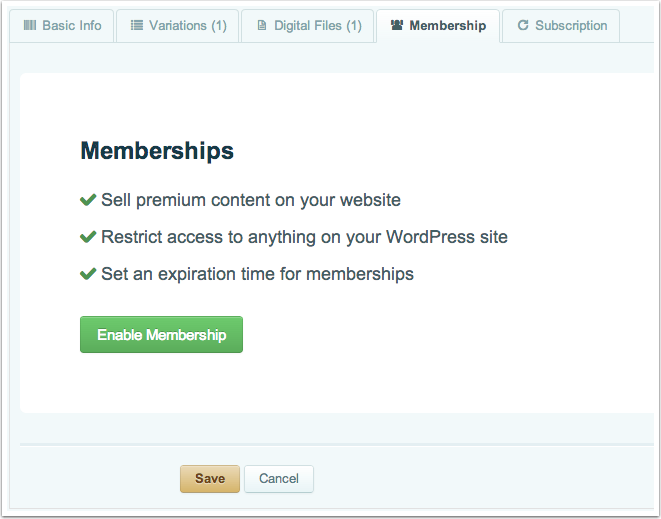 A membership product and a subscription product are both ways to sell access to content on your WordPress website. The difference is that subscriptions include recurring billing and memberships products do not. Therefore, you cannot have a product that is both a membership and a subscription at the same time. Just remember, if you want recurring billing the create a subscription, if you do not want recurring billing, create a membership product. To create a membership product you must first enable the membership option for your product. Once membership is enabled, you can specify the membership duration by a number of days. Click red 'Disable Membership' if you want to remove the membership option from your product.